Now before you label me as a total weirdo (if you haven’t done that already! ), let me assure you that we get plenty of screen time. Nate is an IT guy, after all! At last count, we had eight (mostly) working computers in our house. And one of those is hooked up to a projector that allows us to stream our favorite shows. So why don’t we have an actual television? Which means the TV is never on as background noise. Which means my toddler doesn’t get engrossed in a cartoon long enough for me to braid her hair. Which means I don’t plop the girls down in front of a show when we’re having a rough morning. Which means I can’t pass the remote off to my toddler while I get dinner ready. Which mean that our 2 1/2-year-old daughter isn’t interested in TV, because she’s never watched a single show or movie. And that, folks, is where we start to sound like a houseful of counter-cultural crazies. Because, seriously, how many kids do you know who are that close to being screen-free? Don’t worry, I’m not going to make you feel guilty about your decision to let your kids watch TV. If majority rules, I’m the clear loser. Besides, I don’t think TV and movies are bad. We ended up here because I’m a rule follower. And when I read that the AAP said no screen time for kids under two, I took it to heart! 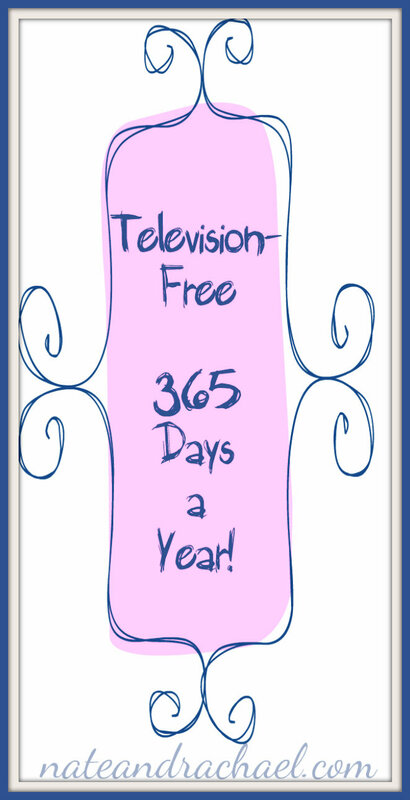 2 1/2 years later, our toddler’s life has no place for TV. One of these days, she’ll watch Elmo on Netflix or the short 15-minute Shirley Temple movies my parents got her for Christmas, but not yet. Our routine works without it. So if we don’t have the TV on ever, what do we do instead? If she watched TV, I’d probably let my daughter watch something first thing in the morning while I’m waking up (I’m the late riser!) and feeding the baby. But my toddler is content to play by herself in her bed. I love this time of the morning. It’s the only time she’s awake and alone, and she talks to herself the entire time. She’s processing, repeating, and practicing things that she’s heard recently. If I can’t sleep in until noon, at least I have the cutest little wake up call. After we’re all awake, dressed, fed, and tired of exploring things around the house, we leave. Our town is small and we walk a lot of places; otherwise, I might spend as much money in gas as you do on cable. I like to get out of the house around 10:30. That’s around the time when we all start to fuss. Each day we have a different destination: grocery store, science time or open gym, play date, museum, library or daddy date. That’s our usual five-day routine. If we have nothing planned or it’s an unusual day, we’ll take a walk, meet up with neighbors, or just hang out in the playroom. If the girls wake up early, I struggle with my “me time” being cut short. And that’s probably when the baby gets the most secondhand exposure to screens. I’ll try to finish up while she’s playing. After Nate gets home, we walk. Have you met our dog? She’s full of energy and requires two long walks every day. So we bundle up and walk in the cold and snowy winter, rainy spring, humid summers, and windy fall. Then a late dinner (like 7:30 or later! ), baths, books, and bed. Where in that schedule is there a time or place for TV? Like I said, we’re not against TV, we just have built our routine around other things. If I haven’t totally isolated or offended you, hang around! Next time I’ll share our strategic use of technology with our daughter and how Nate and I get our fix of Lost, Downton Abbey, and Revolution! While you’re here, check out some of these other blogs and bloggers with screen-free ideas! Thank you so much for sharing how your Screen Free lifestyle works for your family. When you have a plan that you can stick to that’s awesome! For us I think that toys brought TV to us quicker than I was ready for with my now 2 1/2 year old, which is part of the goal of Screen free Week and Campaign for a Commercial Free Childhood is to address how many companies are forcing TV on us as a culture. Look at food containers at the store, clothing and toys and how many of them relate to television characters. Just my thoughts. Thanks for hosting this Screen Free Activities & Resources Blog Hop with me! How I envy you! We don’t have cable either but we do have a roku and Apple TV. So we use Netflix and Hulu for everything. Unfortunately, my son knows how to work the roku and gets way more tv than I would like. But I limit him to mostly documentaries and he loves them! I control the queue so I can limit the useless shows. It’s nice not having him beg for TV-related toys. I’m going to try really hard to keep TV out of my daughter’s life until she is 2 but I’m not sure how feasible that will be. I will just use your story as inspiration! We do own one television, but we don’t turn it on very often. My husband and I will watch TV after the kids go to bed maybe once or twice a week. The kids will watch something maybe once a month, although sometimes they will go several months without watching TV at our house. Like you, when the kids were younger we organized our day around doing other things, and as the kids got older we never saw a reason to start watching more TV since they find plenty to do without it.